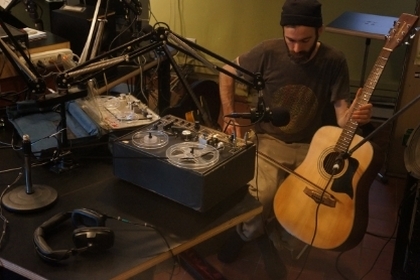 In the decade that he has called Montreal home, Nick Kuepfer has ventured through a wide range of sonic territory: from playing with infamous noise rockers AIDS Wolf to layering minimal guitar compositions with ambient drones, his contributions to the city’s musical community are stunning in both their quality and diversity of sound. Keeping with his tradition of collaging unlikely sonic textures, Nick’s live performance during the Constellation Records-curated Montreal Sessions found him alternately plucking and bowing an acoustic guitar over unearthly tape loops. At once rich and subtle, this piece will reward those who listen closely. If you just can’t get enough Constellation infused live radio performances, you can definitely also revisit the time when Jerusalem in my Heart tickled our transmitter back in the second week of the local label’s time with us. That most glorious of sessions is over This Way!